Use this link to save 30% today off of retail price. Get the lowest ticket price by booking online. Book online for prices starting at a low $51. Come watch your favorite Friends with your friends at this great price. A 90-minute show based on the TV hit series Friends that follows a group of 20-something pals as they navigate the ups and downs of life in Manhattan in the 1990’s. Cue the music and sing along “I’ll be there for you…” as you join in the fun with Friends! The Musical Parody. 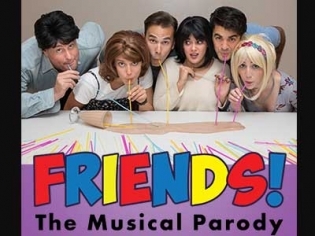 This production takes all of your favorite Friends moments and wraps them into a hilarious fun-filled musical that lampoons the craziness that was Friends. Enter Central Perk and join Chandler, Rachel, Ross, Monica, Phoebe and Joey on their crazy misadventures living, laughing and stumbling through life in 1994 New York. You will reminisce about the halcyon days of watching the show on your favorite couch and wishing you were part of the Friends gang. Make sure your Netflix subscription is up-to-date because you will want to binge watch the show after seeing this hilarious parody.